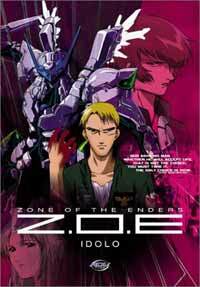 Notes: This OAV is a prequel for both the Zone of Enders: Dolores television show and the Zone of Enders PS2 game. In 2167, tensions run high between the Martian colony and the Earth. Decades of mistreatment have lead to a strong desire for Martian independence. Though independence was a mere dream before, the development of a new type of orbital weapon system may provide the colony with just the weapon it needs to challenge Earth. Soon, a brash young Martian Lieutenant, Radium Lavans, will find himself testing one of the most powerful weapon systems in the Solar System. This is a pretty straight forward title really and serves its function well as a prequel. In its short fifty minute run time, it does a fine job of presenting the current political situation, some of the nature of the Martian colonies, and the general attitude of the Earth and its military toward the denizens of the Red Planet. Though I had seen much of the television series and played some of the game before seeing this title, I still think that a stand alone viewer will in no way be confused by any of the plot or the motivations of the characters. I will say though that certain parts of the plot felt a bit rushed and could have better handled if they had a longer running time. While not perhaps not as deep in its characterization as it could have been, the OAV does do a good job of providing some decent character depth to most of its main characters, particularly Lieutenant Lavans. A few character development elements felt a bit rushed, but I still found myself caring about the characters and concerned about their fates even with the short running time. Most of the Earthers we encounter are kind of presented as one-dimensional complete jerks, which I find a bit annoying. I like a bit more nuance to my antagonists, but that element didn't seriously detract from my enjoyment of this title. There is a lot of mecha related action in this title and I thought it was done rather well. The animation for most of the mecha scenes is fluid and some of the final battles near the end were quite well done. There are a few short battle scenes that don't involve mecha and they weren't anything spectacular, but they definitely weren't cheap looking either. While not completely unstoppable, Idolo is a super weapon and those who get annoyed with the idea of one mecha blowing away scores of their opponents might find certain scenes a bit irritating. While this OAV serves best as the prequel to the video game and the television series, as I noted before no knowledge is required of those titles to enjoy this and I think it does a good job of standing on its own as science fiction action title. Though if you are a fan of the game or the television series, I would recommend watching Idolo as it will enhance your understanding of the universe and some of the characters involved in both. Some of the events bring a particular poignancy to the choices involving the voice and naming of the orbital frame in the television series as well. I should note that this is a bit more grim in overall tone than the television series though. Recommended Audience: There is quite a bit of violence in this title. Most of it is mecha violence but you do see a number of people get shot and there are two rather brutal (though brief) beatings involving people's fists. You get a few vaguely suggestive sexual situations, but you don't really see anything. Overall, I would say this title is safe for teens and above.